Make a classy addition to your bed linen collection with this bed sheet and pillow cover set. It features a self pattern that adds to its look. On the other hand, it has been tailored with care using premium quality cotton so that it is easy to maintain. 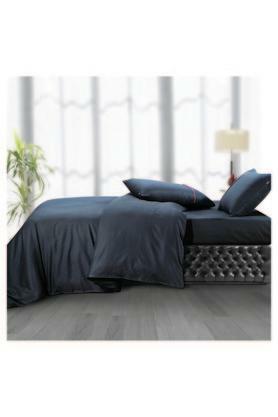 Dimensions: Bed Sheet - 274 x 274 cms, Pillow Cover - 46 X 69 cms. Tailored to perfection, this bed sheet and pillow cover set from the house of Spread will be the right pick for you.